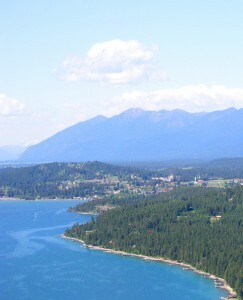 Bigfork is nestled on the NE corner of Flathead Lake and to the west of the Swan Mountain Range. Find homes for sale in Bigfork, MT! Platted in 1901, Bigfork, MT is a charming village set on the NE shore of Flathead Lake at the mouth of the Swan River and is home to fine art galleries, gourmet restaurants of varied cuisine, unique shops, a lovely museum with a mix of art and history, excellent accommodations and most services in a quaint western setting. Here is a neat little video about the area. After you’ve fallen in love with Bigfork, talk to us about moving here! We can show you great Bigfork homes for sale to suit you in this special place or find you a commercial space or business opportunity. Bigfork is unique in that it is unincorporated… that means that if you want something done, you do it yourself as there is no government to ask! That” get it done” attitude is often lead by the Bigfork Chamber of Commerce, CFBB (Community Foundation for a Better Bigfork), and supported by various service organizations like Rotary Club of Bigfork and the Bigfork Ladies Service Club. Such civic activity led Bigfork to be named one of the 100 best communities for young people in 2011 by the “America Promise Alliance” (chaired by Colin Powell). The “locales” of Ferndale, Woods Bay, Swan Lake and north toward Creston are an extension of the village. 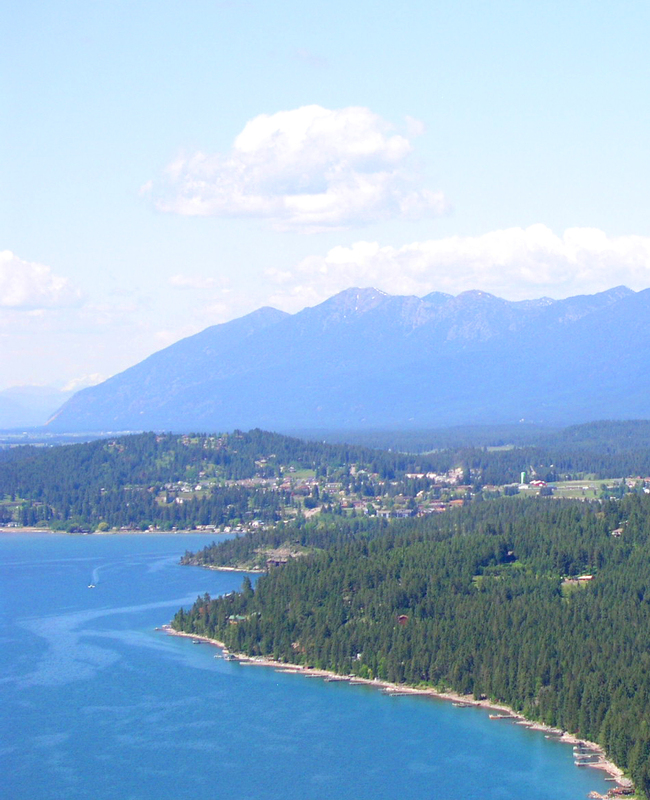 Highway 35, also known as the Eastshore Route, offers a scenic drive south to Polson, MT overlooking beautiful Flathead Lake vistas through cherry orchards, and by lakefront homes both petite and grand. Southeast from Bigfork take the Swan Hwy (Hwy 83) and travel past Swan River, by Swan Lake into scenic Swan Valley south to Condon and Seeley Lake. 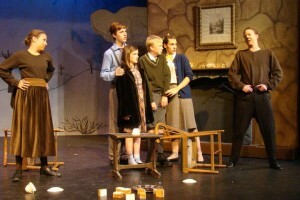 Scene from Narnia, a 2010 production of the local children’s theater. Bigfork is home to the Eagle Bend Golf Course, which has been rated as one of the most challenging and beautiful golf courses in the nation. The Bigfork Center for the Performing Arts is home to the Bigfork Summer Playhouse celebrated as one of the northwest’s finest repertory theaters for over 50 years. 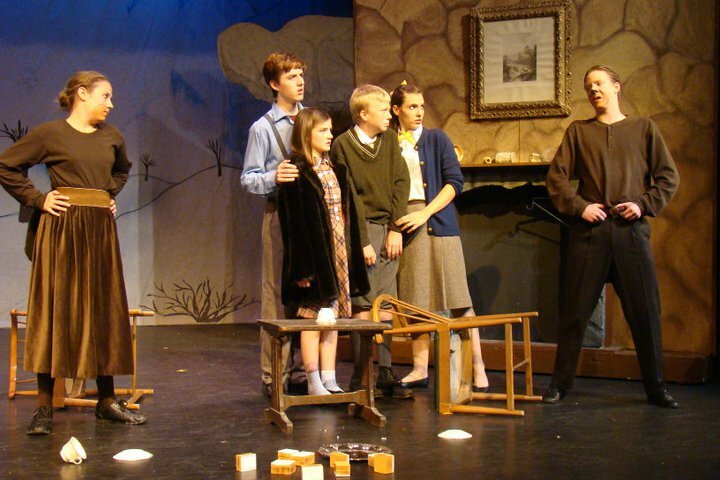 The Center also hosts the Bigfork Playhouse Children’s Theater. Wayfarer’s State Park on the shores of Flathead Lake has overnight camping and is also a great day spot with picnic tables, scenic rocky cliffs and a boat launch into Flathead Lake. The west entry to Glacier National Park is only a 45 minute scenic drive to the north. The Whitefish Mountain Ski Resort and Blacktail Mountain Ski Area are within an hour for beginning to expert downhill skiing and snowboarding. Just northeast of Bigfork near the entry to Jewel Basin is the Nordic Center with cross country trails. Run by a local family, Base Camp, is a truly unique opportunity to experience dog sledding in winter and kayak & SUP boat rentals in summer. Add a mix of speed and water and try wakeboarding lessons on Echo Lake with the Flathead Wakeboard Academy. Or, rent a boat and cruise out onto Flathead Lake for the day. Winter brings the annual Polar Bear Plunge (2013 photos) in nearby Woods Bay. Seasonal events include the Whitewater Festival (kayaking), Festival of the Arts and Crown of the Continent Guitar Festival. Bigfork Montana was voted as “One of the 50 Great Towns of the West” and designated as “One of the 100 Best Small Art Towns of the Nation.” Connect with the Bigfork Chamber of Commerce to keep up-to-date on local happenings. Notable: Bigfork Vikings win State Class B Football championship in 2010. and Win State Class B Basketball championship in 2014! Destination Imagination Team wins state competition in 2014! Scott, Diana and Kellie, with the rest of the locals of Bigfork, stop by the Garden Bar downtown on Electric Avenue for a great burger and a cold beer. Weekends are filled with live music in the back patio area. For upscale eating, dine overlooking Flathead Lake at Schafer’s, or classic dining at Grill 459 on the 2nd floor above Electric Avenue. Breakfast die-hards eat at the Echo Lake Cafe in “rural” Bigfork or in the village at Pocketstone Cafe on Electric Ave. There are diehard fans of Mexican food at El Topo or the more casual Taco Mexico. The newly renovated darling is SakeToMe Sushi where you really should call for a reservation – its delightfully beautiful food. If you want to take a scenic drive before dining, spend a few minutes getting out of town, down the eastshore, for a seat on the deck overlooking Flathead Lake at The Raven – Bigfork restaurant; with a slogan like “Sleep, Eat, Drink” you know you won’t have to worry about driving home if you don’t want to. Further down the lake is barbecue at the East Shore Smoke House . For a quick drop in try the Vessel for a homemade fresh salad or wrap. Pizza, as usual, deserves its own paragraph starting with award winning When In Rome, where you can try unusual toppings. A special pie is topped with grilled lemon rind and balsamic – delicious! Take out is quick with family owned Rosa’s Pizza at the south end of town. For wood fired style pizza choose Riley’s Pub at the Mountain Lake Lodge in Woods Bay. Kellie fulfills her daily java jolt and conversation with the owner, Trish, of Buzz n’ Bagels. While she’s making up your favorite latte concoction in her little red trailer, you can view the scenic Swan Range on Hwy 35 just north of Bigfork.